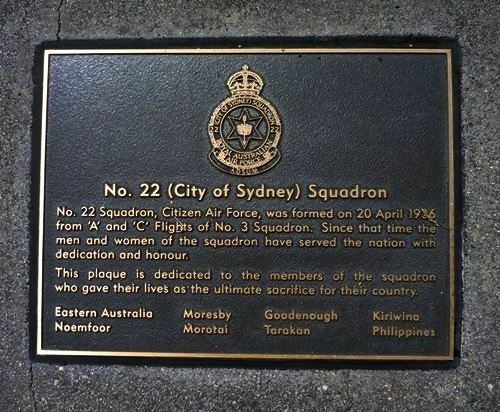 Plaque dedicated to No.22 Squadron. The plaque was dedicated on the 60th anniversary of a feat that helped earn a No. 22 Squadron Boston pilot the Victoria Cross. On March 16, 1943, Flight Lieutenant William Ellis Newton persisted with an attack despite damage to his aircraft over Salamaua in New Guinea. Hit again two days later, the 22 Squadron pilot ditched into the sea in an attempt to save his crew. Captured by the Japanese, he was later beheaded. No.22 Squadron, Citizen Air FOrce, was formed on 20 April 1936 from "A" and "C" Flights of No. 3 Squadron. Since that time the men and women of the squadron have served the nation with dedication and honour. This plaque is dedicated to the members of the squadron who gave their lives as the ultimate sacrifice for their country.